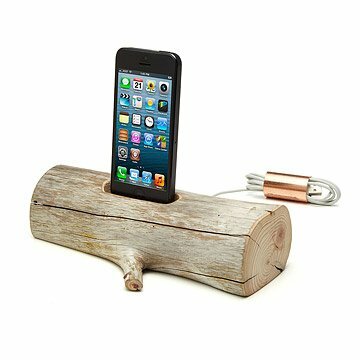 These stylish smartphone docks are handcrafted from driftwood gathered from the beaches of Maine. The epitome of modern electronic design is now paired up with the timeless, organic minimalism of nature. These docks for iPhone and iPod are handcrafted from natural driftwood, polished to a velvety smoothness by sand and surf before washing up on the stony shores of Maine. That's where Lee Goodwin and his team gather them, select each one for size and shape, and craft them to fit the contours and cord of your device. The juxtaposition of organic and artificial, contemporary and timeless transforms your personal electronics into a piece of functional art. Handmade in Maine. Together with a colorful team of boat builders, photographers, and potters, woodworker Lee Goodwin transforms natural driftwood into functional art pieces. "The driftwood has been sculpted by wind, sand, and sea, which gives each piece such character. We love giving the iPhone an element of earth. Our docks let people hold something real, something that has tactile and quantifiable existence. The tide brings the driftwood in, and we send it back out—there is something symbolic about that." Because driftwood used to create the docks is sourced directly from the coast of Maine, no two docks will be the same. Variation is to be expected. iPhone 5 dock is equipped with lightning connector for iPhone 5, 6, 6 Plus, 7 and 5th generation iPod. This is a beautiful product. It is smaller than expected considering it is a piece of art. This was the perfect Christmas present. It was the perfect present for my fiancÃ©. He is very hard to shop for because he is the type of guy if he wants it he buys it, so he h's everything. He loved this product and he even stained the wood so it would match the furniture in our bedroom. He loved it and I loved it. It's pricey but it's worth it!!!!! I loved the look of this and bought it as a gift for my dad. While the piece is nice, the charger doesn't work consistently. When you plug in your phone it says that it is not an adaptable charger. I attempted 4-5 times disconnecting and reconnecting and eventually the phone would charge. But it certainly is inconvenient. And for a phone charger this expensive, I would expect it to have higher quality components. Overall, disappointing. Got this for my husband as a birthday gift and he loved it! The product is beautiful and useful. I love that it can sit on our bedside table and look great but also serves a purpose. It eliminated the problem we had of visible chords too! Very unique! Love the size, quality, look and everything. The charger that comes with it works perfectly. Not as clean and sanded looking as it is on the pictures but I like that rustic look so I don't mind it. Great product! Loved the unique design as did the recipient. Neither of us liked the fact than you MUST remove any case from the phone in order for the charger to work. Not always easy. This particular piece of driftwood was particularly drab compared to the sample photos, but the real disappointment was in having to remove the phone case each time to charge. Great gift for those who not use a phone case however! I gave this product to my dad to use in his office which has a pretty manly decor. His phone was always dying at work. Hopefully this will keep his phone charged and ready for use as needed while keeping up with his decor rather than becoming an eyesore. Bought this for my husband as a Christmas gift and he absolutely loves it. He has an iPhone 6 Plus and is able to charge his phone with the case on no problem. My husband just loves this! It was one of his favorite gifts!